A spacious property for groups of up to 13 who can enjoy the luxury of 7 bedrooms, 4 Bathrooms, fully fitted kitchen, conservatory, veranda, large entrance porch/drying area. 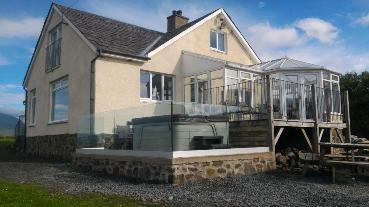 Set 10m from the sea with breath taking views of the Sound of Mull and Glenforsa from large windows and conservatory. Built in 2014 this 1st floor accommodation has patio windows with juliet balconies, stunning views over looking the Sound of Mull and Salen Bay. 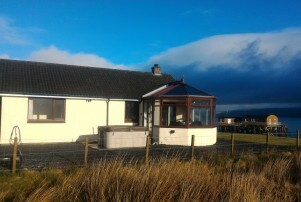 For pricing and availability please go to the House, Lodge, Pier Point or Apartment pages. Operational since March 2016, Pier Point is a new luxury lodge on the head of the pier sleeping 4. The only accommodation on a Pier in the UK!! Pier Point and other property please see WEBCAM page or please call for special 'deal'. Thank you to Paul Connor staying in March 2017, please see the excellent video. Sit back and enjoy the ride!!! then have a look at Mull Tasty Treats option on our Eating In page. 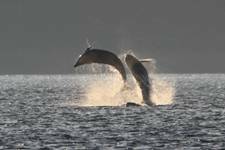 Plenty of wildlife to be seen at or near Salen Pier. Sitting on the water's edge enjoying panoramic views across and down the Sound of Mull, with access to their own private shore, slipway and 70m pier - we offer a superb location for divers, sailing, fishing, walkers, wildlife and water enthusiasts. Salen is a 15 minute drive from the main ferry crossing from Oban to Craignure on the main A848 to Tobermory. 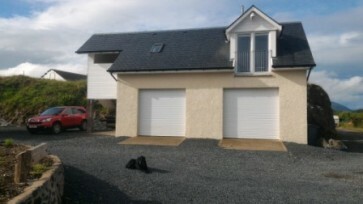 It is also only a 10 minute drive from the Lochaline to Fishnish ferry crossing. 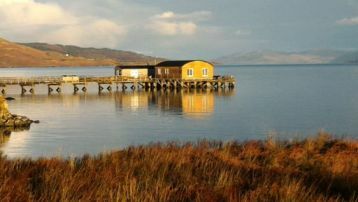 Salen Pier Holidays offers a high standard of quality self catering accommodation for you to enjoy the magnificent views from all its properties in a central location for you to tour the delights of both North and South of the Isle of Mull. Due to its location it is virtually midge free. With a deep water pier there is easy access via the private slipway to launch boats. Plus the pier is ideal for shore fishing, at guests own risk. For a Video Tour please use the link.